This publication examines the opportunities and challenges, for business and government, associated with technologies bringing about the “next production revolution”. These include a variety of digital technologies (e.g. the Internet of Things and advanced robotics), industrial biotechnology, 3D printing, new materials and nanotechnology. Some of these technologies are already used in production, while others will be available in the near future. All are developing rapidly. As these technologies transform the production and the distribution of goods and services, they will have far-reaching consequences for productivity, skills, income distribution, well-being and the environment. The more that governments and firms understand how production could develop in the near future, the better placed they will be to address the risks and reap the benefits. The Global Competitiveness Report 2016-2017 assesses the competitiveness landscape of 138 economies, providing insight into the drivers of their productivity and prosperity. This year’s edition highlights that declining openness is threatening growth and prosperity. It also highlights that monetary stimulus measures such as quantitative easing are not enough to sustain growth and must be accompanied by competitiveness reforms. Final key finding points to the fact that updated business practices and investment in innovation are now as important as infrastructure, skills and efficient markets. Switzerland, Singapore and the United States remain the three world’s most competitive economies. This report brings together evidence about today’s older population, with future trends and projections, to identify the implications for the UK. This evidence will help government to develop the policies needed to adapt to an ageing population. This book addresses the rising productivity gap between the global frontier and other firms, and identifies a number of structural impediments constraining business start-ups, knowledge diffusion and resource allocation (such as barriers to up-scaling and relatively high rates of skill mismatch). Analysis based on micro and industry-level data highlights the importance of reallocation-friendly policies, including well-functioning product, labour and risk capital markets, efficient judicial systems, bankruptcy laws that do not excessively penalise failure, housing policies that do not unduly restrict labour mobility, and improvements in public funding and organisation of basic research which do not excessively favour applied vs basic research and incumbents vs young firms. Productivity is the ultimate engine of growth in the global economy. Raising productivity is therefore a fundamental challenge for countries going forward. 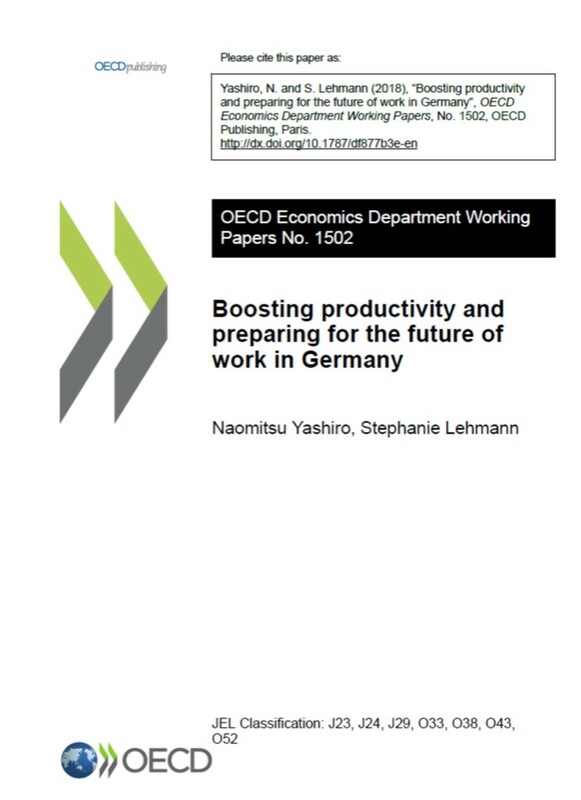 This new OECD report on The Future of Productivity shows that we are not running out of ideas. In fact, the growth of the globally most productive firms has remained robust in the 21st century. However, the gap between those global leaders and the rest has increased over time, and especially so in the services sector. This implies that knowledge diffusion should not to be taken for granted. Future growth will largely depend on our ability to revive the diffusion machine, both within and across countries. At the same time, there is much scope to boost productivity and reduce inequality simply by more effectively allocating human talent to jobs. The Agricultural Outlook 2015-2024, is a collaborative effort of the OECD and the FAO of the United Nations. It brings together the commodity, policy and country expertise of both organisations and input from collaborating member countries to provide an annual assessment of prospects for the coming decade of national, regional and global agricultural commodity markets. seguida se explora el efecto potencial de tales tendencias y escenarios sobre cada una de 5 metas prioritarias destacadas por gobiernos, líderes políticos y sociales y expertos de los países latinoamericanos. En particular, se abordan los temas de gobernabilidad, desigualdad, productividad, integración y alianzas internacionales, desarrollo sustentable y cambio climático. Luego se deducen aquellas áreas que ameritan un seguimiento permanente, incluyendo las estrategias y políticas de naciones avanzadas e innovadoras. Por último se señala como organizar esta función prospectiva y reflexión estratégica en gobiernos e institutos, y la conveniencia de articular una red latinoamericana. Al lector se ofrece los vínculos directos a los estudios referidos. Public policy in Latin America suffers from a lack of long term perspective. This inevitably limits the ability to seize opportunities or contain risks that present themselves. This publication analyses six major global tendencies that have been identified by leading prospective institutions. Various scenarios are used to explore the potential effect of these tendencies on five goals previously identified by governments, political and social leaders, and experts on Latin America. Particular attention is paid to the themes of governance, inequality, productivity, integration and international alliances, sustainable development and climate change. Subsequently, areas that require a more continuous monitoring are identified with reference to existing methodologies in other countries.